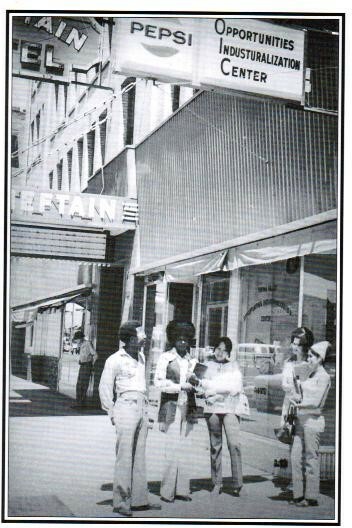 OIC of Washington, (formerly Yakima Valley Opportunities Industrialization Center), was officially formed and incorporated on September 1, 1971 by an interest group comprised primarily of Southeast Yakima Community At work Board Members and supporters of the Southeast Yakima Community Center. At that time, Henry Beauchamp was the Director of the Southeast Yakima Community Center, a multi-service center which housed a wide range of human services for the poor under one roof; access to public assistance, legal aid, food, clothing, shelter services, youth recreation, and health services. These services helped address many of the critical needs faced by community residents: in and of themselves, however, they did not provide a clear pathway to self-sufficiency. All of that changed when Bill Jaquish, a nationally recognized vocational education advocate for disadvantaged people, introduced the Opportunities Industrialization Center training model to Henry. Having learned of the OIC model and grasping its potential for the residents of Yakima County, Mr. Jaquish arranged for Henry to meet James Williams, the Executive Director of Seattle OIC, to learn about the OIC concept. This meeting, held in Yakima, resulted in Henry’s attendance at the 1971 National Convocation of OIC’s of America (OIC-A) in Seattle at the invitation of Mr. Williams. At this convocation, Henry and Eddie Hill met Dr. Leon Sullivan, Dr. Maurice Dawkins and other founding members of the nation OIC family. They were profoundly affected as they were more fully introduced to the meaningful philosophy of OIC and its approach to training. This approach was aimed at empowerment of the disadvantaged through the tools of self-awareness and esteem building education and training. Upon comparison to other approaches, they found that confidence and self-esteem born of motivation and a strong work ethic which includes eight hours of work for eight hours of pay produces a far better success rate in fostering self-sufficiency, than does a hand out. The program and its philosophy so inspired Henry and Eddie that they began the process of organizing an OIC for the Yakima Valley. The received initial support from Mr. Elton Jolly, then Director of Field Support for OIC of America. Mr. Jolly was so impressed with the Yakima contingent’s zeal that he pledged his assistance in bringing OIC to Yakima. After additional support from the OIC of America’s Regional Office in San Francisco, California, Henry became the first Executive Director of this newest OIC while continuing to fulfill his duties as Director of the Southeast Yakima Community Center for almost three years. Yakima Valley OIC became the 100th OIC in America, beginning its first day of training on January 17, 1972 at 19 South Second Street on the ground floor of the old Chieftain Hotel. Initial offerings included typing, bookkeeping, filing, grocery checking, GED instruction, counseling, job placement and follow-up. After moving to 201 South First Street in October 1974, OIC was able to expand its course offerings to include English as a Second Language for newly arriving Asian refugees. During this period, OIC also became the designated limited purpose agency for the United States Department of Health and Human Services – Office of Community Services. It was through this channel that many new programs were initiated, including energy assistance and home weatherization. At this critical point in OIC’s development, the agency received significant support from the Catholic Diocese in the form of Sister Nora Murphy, a Dominican nun who was a powerful advocate for the poor. She was an excellent grants writer who helped Yakima’s OIC immensely during its early years of growth and development. By 1983, OIC had outgrown its second home and eventually moved to its current location at 815 Fruitvale Boulevard. On the heels of this success, OIC was able to acquire the adjacent Broadmead Shopping Center and the Social Security Administration Building in Yakima, as well as two Properties In Sunnyside. These properties were acquired To help meet the growing needs of residents Of Yakima County. From an initial operating budget of $156,000 OIC was able to serve 150 clients and place 124 into jobs. OIC has continued to grown along with community needs, serving thousands of residents of Washington state each year. It is estimated that the agency’s economic impact over the past 40 years has been profound, bringing in more than $90,000,000 into our state; at least 90 percent of these resources have enriched the Yakima Valley directly. Today, OIC employs 125 fulltime employees, making it one of the larger employers in Yakima County. Dedicated agency staff have also helped hundreds of public assistance recipients, ex-offenders, troubled youth and adults facing personal calamity piece back together and gain dignity through hard work, saving our taxpayers millions of dollars and increasing the number of individuals who can be proudly counted as taxpayers themselves. The needs of Washington’s communities have grown as OIC of Washington has grown since our beginnings in 1971. While we celebrate our accomplishments, this is also the time to redouble our efforts and continue our march forward.